^ a b c d Beekes, Robert S. P. (1995). Comparative Indo-European Linguistics: An Introduction. Amsterdam: John Benjamins. ISBN 90-272-2150-2 (Europe), ISBN 1-55619-504-4 (U.S.). ^ Buck, Carl Darling (1933). Comparative Grammar of Greek and Latin. Chicago: University of Chicago Press. ISBN 0-22607-931-7. ^ Sihler, Andrew L. (1995). New Comparative Grammar of Greek and Latin. Oxford: Oxford University Press. ISBN 0-19-508345-8. Mayrhofer, Manfred (1986). Indogermanische Grammatik, i/2: Lautlehre. Heidelberg: Winter. Szemerényi, Oswald (1996). Introduction to Indo-European Linguistics. Oxford. Whitney, William Dwight (1924). Comparative Grammar of Greek and Latin. Delhi: Motilal Banarsidass Publishers Private Limited (reprint). ISBN 81-208-0621-2 (India), ISBN 0-48643-136-3 (Dover, US). Christian prayers projected to PIE by Raphael Sawitzky. 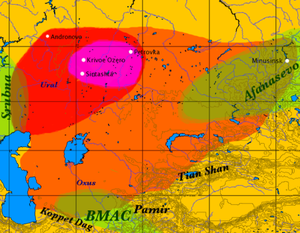 PIE root etymology database, compiled from Walde-Pokorny by L. Nikolayev and from Friedrich, Tischler (Hittite) and Adams (Tocharian) by Sergei Starostin.